Now, all sounds fun and I could go this way but I just discovered that this may defeat my indirect drawing, because of how I have to specify offsets into buffers (remember - I bind them at the beginning and do not change, so starting offset is 0 and I abuse baseVertex to offset the index into vertex buffer to accomodate that there is a single big buffer having all the meshes rather than one buffer / buffer which is bound as a range to a specific offsets outside of draw call). 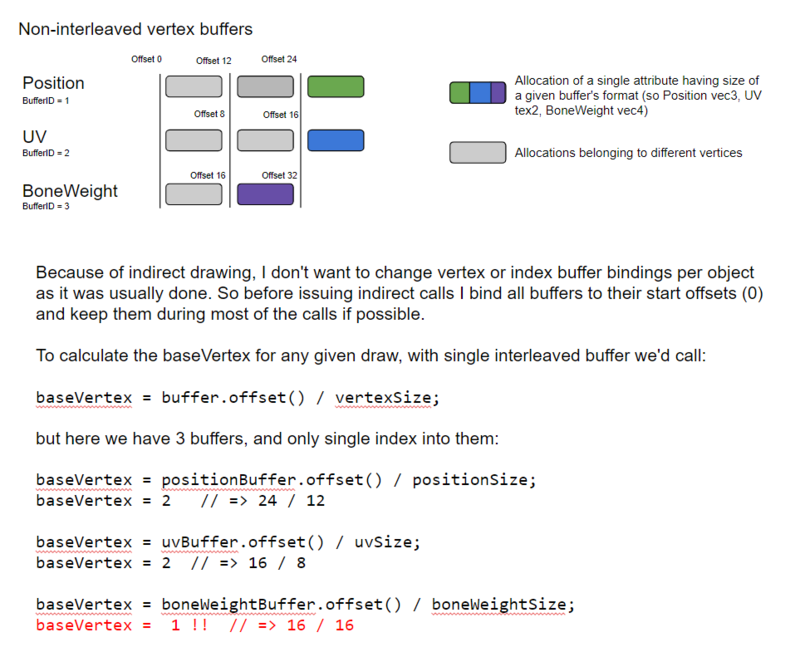 It would work if all buffers are advanced at the same pace - so if I allocate vertex attrib in POSITION buffer, I do this for all other involved buffers, because if I don’t, buffers go out of sync and it’s impossible to calculate a single, common baseVertex to provide in indirect call (there it’s called “firstIndex”). As you can see we end up with non-uniform baseVertex if we mix several buffers that are not in sync. [/b]I see no other solutions that would not defeat the indirect draw, which I think is such a big gain that I’m probably rather going to give up on non-interleaved unless you tell me this is wrong for some reason I don’t see. Has anyone thought about it? Seems like indirect is not yet so popular (and I can see why - implementing it is not exactly feasible if someone has already working engine and don’t want to make some sacrifices), so it’s not possible to find others with such problems. Interleaved versus non-interleaved doesn’t matter. Either way, all objects drawn using the same draw call must have the same attribute structure. There’s no particular reason to keep the same attribute array state (i.e. VAO) for multiple draw calls. If you have different types of object with different sets of attributes, you may as well just switch VAOs between calls. Well, I am changing VAO between calls when it matters - it’s about not changing it in the middle of indirect call. To add to what GClements said, the basic idea is this: the number of VAO changes should not be proportional to how much stuff you draw. That is, it shouldn’t matter if you draw 1 character or 50,000; you should change VAOs the same number of times. So you should break things down into a small number of well-defined sets of kinds of rendered stuff. Like UI stuff, character models (skinning), static models, dynamic models, particle systems, etc. Or whatever arrangement you want. Each kind of rendered stuff should have a single VAO, with all such models sharing the same arrays, vertex count, etc. That is not “abuse”; that is exactly why baseVertex exists. I’m not entirely sure, but I think that what he’s doing is storing multiple sets of geometry with differing sets of (interleaved) attributes in a single buffer, and specifying a base vertex rather than changing the offsets. So long as the base offset of each set of data is a multiple of the stride, this would work. But it isn’t a rational approach, IMHO. If you have different sets of attributes, either you’d still need to change the strides, or you’d need to leave space for the unused attributes. And the latter would work just as well with non-interleaved attributes. it’s about not changing it in the middle of indirect call. You don’t need to change it in the middle of an indirect call. Just set the buffer offsets appropriately for each VAO rather than setting them to zero then offsetting the base vertex to compensate. But yeah what Alfonse said is exactly what I’m doing - I can’t rebind buffers in the middle of indirect batch, so I’m counting on baseVetex offset, and with non-interleaved it’s not exactly easy to use it as you may have buffers that are not on the same “vertex number” -> again ,see diagram. I guess there is no way really around it - question was more about non-interleaved which leave you with N buffers instead of 1 buffer - and you have no guarantee the offsets will be continuous to use baseVertex. Bah. Well that’s my problem and what I’m asking about - I even drawn an image of buffer representation showing where the problem is. That image really doesn’t do anything to explain what your problem actually is. There’s no difference between what you can do with interleaved attributes or non-interleaved attributes. The fact that non-interleaved attributes require a different stride for each attribute isn’t an issue because you can just provide a different stride for each attribute. You can avoid this by just not batching skinned and unskinned meshes together. Then you can tightly pack your vertices regardless, avoiding (I think) the problem you’re talking about. You don’t have to cram all possible batches into 1 Indirect draw call. If it feels like you’re trying to hammer a round peg into a square hole, it’s probably not a good idea. Having a relatively small number of indirect draw calls per frame is not a problem. I heard the trend is nowadays towards non-interleaved buffers. Where did you read/hear this? In the absence of performance tests that indicate otherwise, you should assume that streaming 1 sequential block of data from GPU memory into the vertex shader is likely to be faster than streaming N sequential blocks of data (each from separate addresses), for the case where you are memory transfer bound. You need to match the length across the vertex attributes, yes (assuming you’re not using vertex attribute divisors of course). However, I’d stop thinking of this in terms of buffer objects. With non-interleaved (or interleaved) vertices, there’s nothing that says that separate sequential blocks of vertex data for each attribute need to be sourced from separate buffer objects. You could have a separate non-interleaved buffer object for each vertex attribute, or you could store your some/all of your non-interleaved vertex attribute blocks for attributes 0…N sequentially end-to-end within the same buffer object, or you could do the latter with 20-100 batches stored end-to-end all within the same buffer object. And similarly for interleaved attribute blocks. You can mix-and-match these anyway you want: for instance, have 5 vertex attributes sourced interleaved from buffer object A along with 1 or 2 vertex attributes (dynamically generated on the GPU let’s say) sourced from buffer object B which may or may not be interleaved. All of these are valid. Generally though, prefer pulling from the minimum number of sequential blocks per batch in the absence of 1) a compelling reason to do otherwise (e.g. some attributes pull in GPU-generated vertex attribute data), or 2) perf tests on all the GPUs you care about indicating that you don’t have to care.